Google’s funny ways of approving and disapproving PPC ads | TransPacific Software Pvt. Ltd.
Of late we had a strange experience with Google’s PPC ad approval/disapproval process. Our PPC advertisement on “ Shopping Cart Migration” was disapproved apparently because we had used Terms : “osCommerce” and “Magento”. As per Google both these terms are Trademarks and cannot be used in the PPC ads . [Trademarks] Trademark in Ad Content or Keyword Insertion: Due to trademark complaints, we don't allow advertisers to use certain trademarked terms or elements in the content of their Google AdWords campaigns unless they comply with our Reseller/Informational Site policy. We are fine with it. But what we noticed was they did approve the PPC ad by Volusion mentioning. 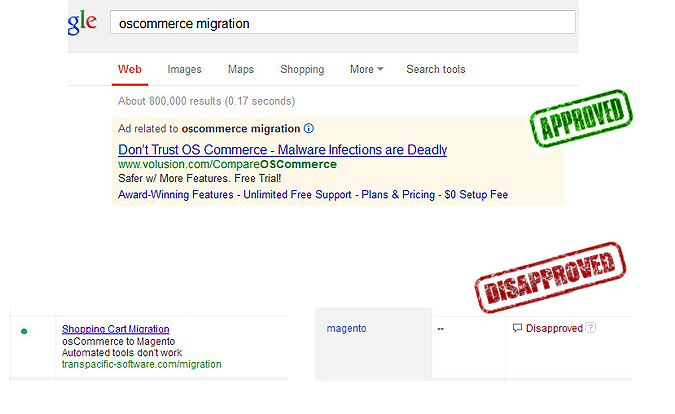 “OS Commerce” instead of “osCommerce” seems like Volusion guys are able to trick the Google’s PPC inspectors.